I posted last week about the Kepler Science Conference at NASA Ames, but there was another much bigger meeting occurring at the same time in downtown San Francisco. The American Geophysical Union hosted their 44th Annual Fall Meeting at the Moscone Center and more than 20,000 scientists and journalists attended. If you’d like to virtually attend AGU, check out the videotaped talks at “Sessions on Demand” and the electronic posters. In honor of the AGU and planetary science, today’s post features a paper by Wieczorek et al. about determining the initial rotation of Mercury. Today, Mercury is locked in a 3/2 spin:orbit resonance, meaning that Mercury spins three times while orbiting the Sun twice. Until the results of the Mariner 10 radar measurements in 1965 revealed that Mercury was in 3/2 resonance, astronomers assumed that Mercury rotated synchronously. Synchronous rotation, in which one side of a planet or moon permanently faces the other body, is a common fate for small bodies orbiting close to larger bodies because the timescale on which tidal torques slow down or speed up the planet’s rotation rate to match the orbital rate is typically shorter than the age of the system. In our solar system, the Moon and many of the moons around the outer planets rotate synchronously, so it was not unreasonable for astronomers to expect that Mercury would follow the same pattern. The leading theory for why Mercury did not end up rotating synchronously is that the moderate eccentricity (e=0.2) of Mercury’s orbit caused the planet to become trapped in the 3/2 spin/orbit resonance as tidal torques from the Sun tugged on the planet. The theory also postulates that Mercury initially spun quickly in a prograde direction and that the tidal torques slowed down the spin rate of the planet. However, a quickly rotating planet with a molten core has only a 26% probability of winding up in the 3/2 spin/orbit resonance and a much higher probability of ending up in a higher-order resonance. In this paper, Wieczorek et al. consider an alternative explanation for how Mercury entered the 3/2 resonance. They find that if Mercury initially rotated in a retrograde fashion, then there is a 68% probability that tidal torques will lock the planet into synchronous rotation. If the planet were then bombarded by a large impactor, the momentum from the cratering event could cause the planet to enter into the 3/2 resonance. The impactor could impart enough momentum that Mercury could have been sped up to a rotation rate faster than the 3/2 resonance rate and then tidal torques could have decelerated the planet until it entered the resonance. Alternatively, the impactors could have sped up the planet just a little so that it exited the synchronous resonance but was still rotating more slowly than the 3/2 rate. If Mercury then entered a period of higher eccentricity, the rotation rate could have been accelerated to the 3/2 resonance due to tidal torques. Conveniently, if Mercury entered the 3/2 spin/orbit resonance because of momentum imparted by a large impactor, then the signatures of the impactor should still be visible on the planet’s surface as a large impact basin. Wieczorek et al. compute the impactor size required to alter the rotation rate of Mercury from the synchronous to the 3/2 resonance and compare the predicted crater size for those impactors to the actual distribution of craters on Mercury. If Mercury entered the 3/2 resonance directly from synchronous rotation, then Wieczorek et al. would expect to find a crater with a diameter between 650 and 1100 km. 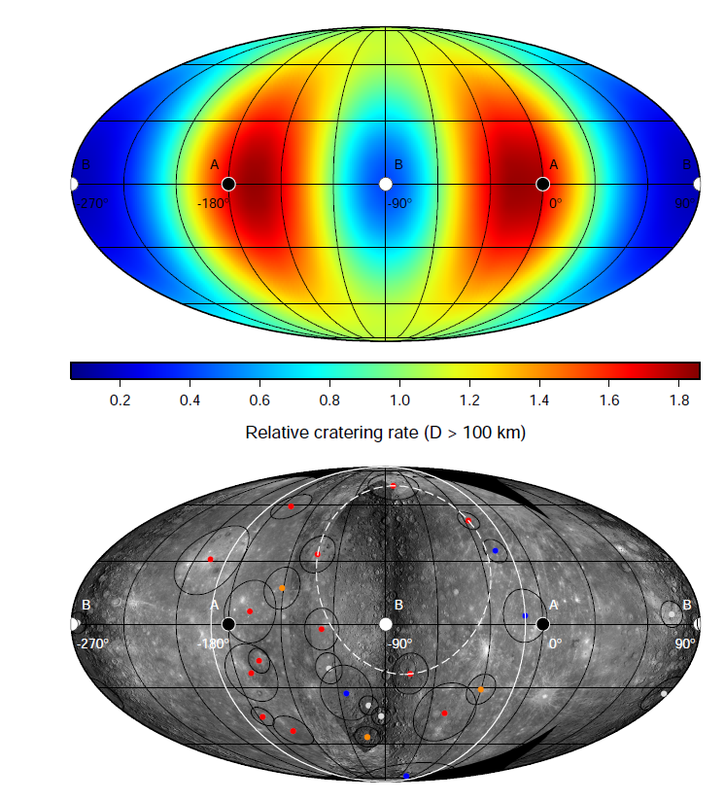 For the second explanation (a slight speed increase followed by acceleration during high eccentricity), the expected crater diameter is only 250-450 km. There are 14 basins on Mercury with diameters 650-1100 km and roughly 40 with diameters 250-450 km, but not all of them have the proper impact orientation or age to be caused by an impactor that knocked Mercury out of synchronous rotation. In addition to computing the expected crater size, Wieczorek also predict the expected distribution of craters on the planet’s surface. If Mercury rotated synchronously, then the density of craters should be higher on the center of the Sun-facing hemisphere and the center of the dark side because of the most likely trajectories of impacting asteroids and comets. By comparison, a non-synchronously rotating planets should have uniformly distributed craters. The figure below compares the predicted crater distribution for a synchronously rotating planet to the observed distribution of craters on Mercury. Wieczorek et al. find very few large impact basins between 0° and 180°E latitude and at equatorial latitudes near 90°W. These regions are shown in blue on the figure and the deficit of craters there is consistent with the hypothesis that Mercury initially rotated synchronously. Wieczorek et al. use Mariner 10 and MESSENGER data to identify craters and quantify their analysis by conducting a Monte Carlo simulation (see Benjamin Nelson’s astrobite for an introduction to Monte Carlo simulations) to determine the likelihood that the observed cratering distribution would occur by chance. They find only a 3% probability that the lack of craters between 0° and 180°E latitude and near (90°W, 0°N) would occur if the craters were distributed uniformly, which lends support to the argument that Mercury initially rotated synchronously. Both the distribution of craters and the sizes of the large impact basins on the surface indicate that Mercury could have been hit by an impactor that knocked the planet out of synchronous rotation, but more study is needed before planetary scientists can determine whether Mercury rotated synchronously. Wieczorek conclude their paper by pointing out that another consequence of synchronous rotation is that the Sun-facing hemisphere of Mercury would be extremely hot and the dark side would be extremely cold. Given the large gradient in surface temperature, volatiles would be expected to accumulate on the dark side of the planet. During impacts, the volatiles would have been melted and might have produced hydrous minerals that could still be on the surface of Mercury today. Future analysis of data from MESSENGER could lead to the discovery of the hypothesized hydrous minerals and present additional evidence of past synchronous rotation. For updates from MESSENGER, check out the NASA MESSENGER website. Simulating the unseen: learning about Jupiter’s unknown impactor through simulations Using observations from home to improve the transit method Detecting Moons Around Exoplanets Mercury’s surprising density: What about magnets?